Our magnetic drums increase the efficiency of sorting plants by generating clean ferrous scrap. The STEINERT MT means you can reliably remove iron from various sortable materials or recover high-purity ferrous fractions. Material flows with a high iron content can thus be prepared for further differentiated sorting. Magnetic drums from STEINERT also protect crushers, mills and downstream processing equipment against wear and destruction. We therefore offer both electric and permanent magnetic drums which can be used in traversing or extracting operation. For your success, we at STEINERT also rely exclusively on proven designs which are continuously improved. Their special design ensures high purity of the sorted products and thus attractive marketing of the ferrous scrap. 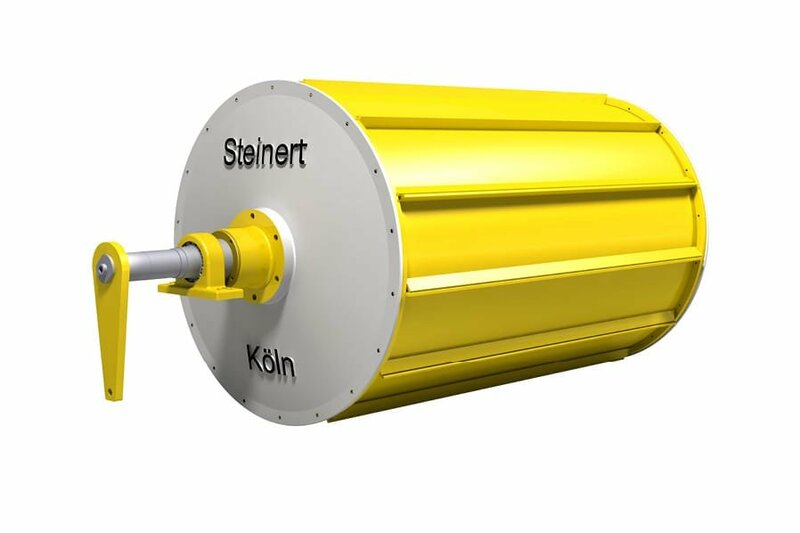 STEINERT magnetic drum separators are also characterised by their extreme longevity. Magnetic drums are used wherever the belt of an overhead suspension magnet wears too quickly or where material that is difficult to collect magnetically has to be separated after the overhead suspension magnet. In most cases the STEINERT MTE electric magnetic drum is suitable for recovering metal from shredder material. Magnetic drum separators also ensure optimal results in the processing of incineration bottom ash from incineration plants before the eddy current separator recovers valuable non-ferrous metals. The STEINERT MTP uses permanent magnetic drums to separate even weakly magnetic components from crushed battery cells or shredded electronic scrap. Ferrous impurities can also be removed from coal and glass by STEINERT magnetic drums prior to further processing. STEINERT magnetic drums can be operated in two different arrangements: traversing and extracting operation. In the case of the classic magnetic drum that operates traversing, the bulk material is evenly distributed via a feed chute and placed onto the rotating magnetic drum. Here magnetic particles are retained on the surface of the drum and transported back, whereas non-magnetic ones follow the laws of gravity and fall down. In this case the drum always rotates in the direction of the supply flow. The material flow is easily managed in this version – not least because the grain sizes are smaller and more even. Low output losses are achieved using a traversing arrangement. The extracting magnetic drum rotates against the supply flow and is arranged above the discharge of a feed chute. Here the magnetic drum lifts magnetic particles from the supply flow and transports them upwards against gravity by means of rotation where they are extracted beyond the drum's splitter point. The metal product is clean and the losses are low. A change of polarity can also result in a "self-cleaning effect" whereby trapped parts like films can be released from the drum surface. We supply our magnetic drums together with other STEINERT sorting machines also in compact form as combination separators.